Guiltypleasure Feb 20 2018 8:17 am It's like I swallow my tears. Giving deep impression. Mina May 14 2014 5:03 am I fell in love !!! After I watched,I cried the whole night..
nie Apr 10 2012 3:26 am Loved this movie! The story was moving and the I really loved the over-all atmosphere/aura of the film. The main cast really did a good job! Even the little girl playing the youngest daughter in the village family was so cute and her expressions seemed so real! I wish to find a better copy since I only watched the non-HD uploads on youtube. Andreas Mar 11 2012 6:38 am Try Yesasia for DVD. You will need however a code free DVD since it is a region code 3 DVD. haribold Mar 05 2012 11:31 am I saw the movie at the Berlinale 2011. I liked it so much! Unfortunately I didn´t find it on DVD so far. Can everybody help me?! HYBK May 10 2011 8:28 am Under the Hawthorn Tree was a great and bittersweet movie. I wish my love was just as sweet and innocent as theirs. The main characters did an awesome job of portraying there innocent and pure love. Not too many love like that nowadays on movies and in real life and...I do miss it. The main guy was very handsome and tall and the main girl was pretty and delicate like a flower. There love was envious. Wish every men were like him; a gentleman. Just sad that it had to end that way. I will never forget that movie. I wonder if Shawn Dou is like that in real life too, hahaha! But if not, at least it was good to know that someone really did exist like that in real life since the story is true. If you guys haven't seen the movie Under the Hawthorn tree, I recommend you to. It has a really great meaning to love and the feeling of it is just like "The Road Home" starring Zhang Ziyi; innocent, pure and bittersweet. I give it a 5 star out of 5, because it really is a great movie and it really touched my heart. 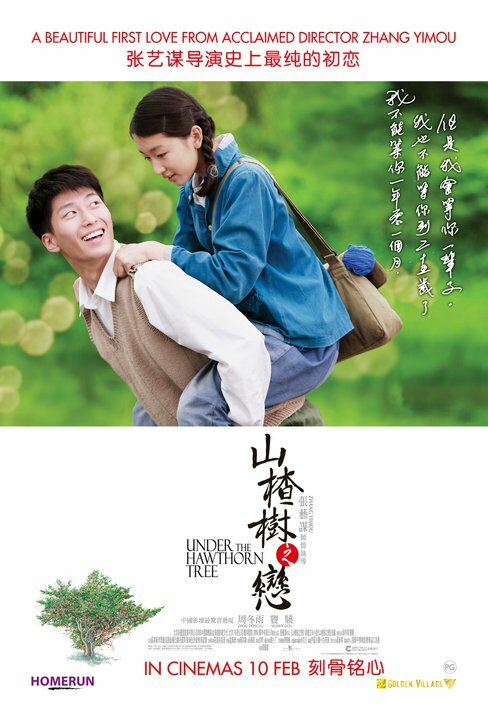 Shawn Dou did a great job for his first movie in Under the Hawthorn tree. It was also the first for the main girl too. They both gave great performances. I hope to see many more of Shawn Dou's movies and Dongyu Zhou's too. Jun May 06 2011 10:33 am This movie is great! And I cried so hard. Really, why does God do this to him? :( But still it's a super nice, touching and meaningful movie! Edwin Li Dec 08 2010 9:04 pm Each actor performs exceptionally well in this movie. First, the movie is based on a real story as it claimed. It moves everybody also because it ends with a sad and heartbreaking ending that Jingjuo and Kinson could not become a happy couple but instead ,Kinson died of lieukimea at a young age. The scene that most touched me is when Sun Kinson looked across from the other side of the river with his arms circled in front of himself as if he was hugging her beloved Jingjuo but actually he knew that was his final time he was able to see her with Jingjuo leaving gradually out of his eyesight.